How do I connect my CCTV Security Camera System? Well I am glad that you asked that. Here we will give you a basic overview of how you do exactly that. If you prefer to watch this in a video you can view it by clicking here for the CCTV Connectivity and Power Supply Training Video. A cable with a central conductor that’s surrounded by a shield sharing its same axis is called a coaxial cable. The primary type used in video security systems is RG59/U. Its a very common cable type and is readily available from local electrical and datacom distributors. There are other types of coax that are used but the RG59/U is the most common and least expensive. The coax is connected to an analog video security system using BNC Connectors. The connectors will twist on to the camera or dvr for a tight fit that will not come off accidentally. 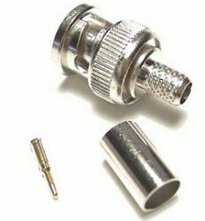 You only need a couple of tools to use the BNC connectors on the Coax. You need a coax wire stripping tool and a Crimping tool to crimp on the connector. See the crimp on pictures down below as an example. Coax can also be ordered as a Siamese cable that will include 18 gauge wire that can be used for the power supply to the cameras. Coax is usually sold in roles of 500 and 1000 ft. The length of cable that you can typically run for RG59/U is 750 feet. Examples of preparing and connecting BNC connectors. Once the connector is on you will use the crimp tool for final application. Some things you should be aware of when using coax for CCTV video security are as follows. You do need to be aware of electromagnetic interference (EMI). EMI can come from electrical wires or machinery and can ruin the video image being transferred through the coax cable. You also have to be careful of the bend radius of the coax. If you bend it too much it can damage the cable and create a loss or short in the signal. Yet another factor for coax is the issue of Plenum vs Non-Plenum. If you are currently a low voltage contractor you are probably already aware of this. Plenum air space in a building is an enclosed space where air is circulated as a part of the HVAC. Standard coax can not be used in this space because it is toxic when it burns. You will need to use Plenum rated cable in this space. Plenum cable is jacketed with a fire retardant plastic jacket of either a low-smoke polyvinyl chloride (PVC) or a fluorinated ethylene polymer (FEP). Plenum rated cable is more expensive and requires Plenum BNC connectors. So if you are installing a CCTV Security Camera System you should carefully review the site to see if you will need to use Plenum rated cable. It will save you time and money to know this up front so you will not wind up in a situation where you have to pull cable out and run it again. Another option for connecting a CCTV security camera system is UTP. UTP stands for Unshielded Twisted Pair. It is your basic category 2 to category 6 wire cable used for phones and networks. What happens is the video is converted on a 100-ohm balanced 24 gauge network type cable (Cat 2 to 6) unshielded to a 75-ohm unbalanced video signal. You have to use a device to convert the signal called a balun. A balun could be passive or active. 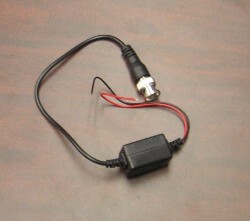 An active balun will allow you a much greater distance for the video signal. The advantage for using UTP is that it has noise immunity. Meaning you will not have to worry about any EMI interference like you do with coax cable. You can get around 1000 ft distance of video signal with a passive system (6000 ft or more with an active system). Another option for connecting a CCTV security camera system is Fiber Optic Cable. Fiber optic cable is very good over long distances. It also offers exceptional video quality with low signal loss. The draw backs would be its very high cost and all of the special handling and knowledge needed to successfully implement its use. Typically only the very experienced installers out there are working with it.